Got advice on a stadium or school? Where's the best place to eat and drink? What traditions do we need to know? How's the parking? Can we bring stadium seats? Got advice or take exception to our reviews? Send us your comments: the Good, the Bad and the Ugly. Let us know you are in the race! We've got Shirts and Throws to track your progress! And Hats and Stadium Blankets to show you're in the Game! 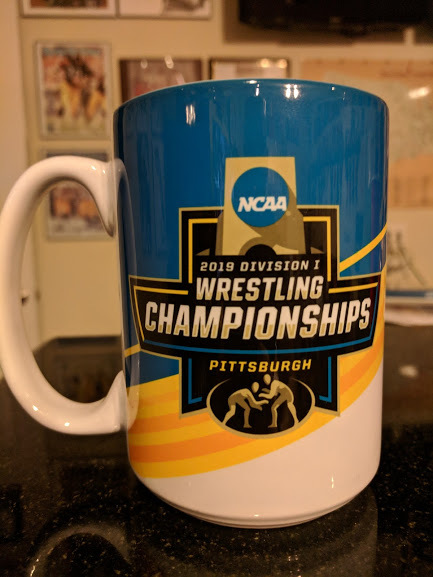 I recently attended the NCAA Wrestling championships in Pittsburgh, Pennsylvania. Having wrestled in high school and then coached kids for a few years, I have always followed the sport. In Pennsylvania, wrestling is big time so it isn’t surprising that a few of my high school teammates ended up wrestling at D1 schools. 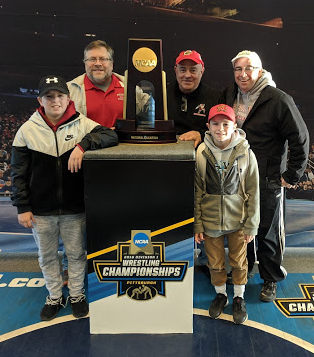 After a few years of planning, we managed to get a group together for the NCAAs. That they were in Pittsburgh this year was a bonus. The tournament runs over three days, Thursday to Saturday, with two sessions a day. One of our friends worked his university connections and we only paid $300 for all three sessions. 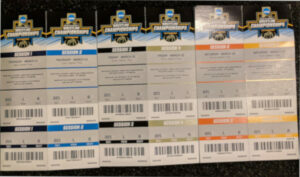 Running up to the start of the tournament, the full set of six tickets had escalated to nearly $1,300. There was an active ticket market throughout the entire week. Not surprisingly, as wrestlers got eliminated, the supply of tickets grew and prices dropped. Ultimately, one of my buddies bought an extra ticket for the finals at $50. So similar to the basketball tournament, there are values to be had at the expense of disconsolate fans as their teams / wrestlers get eliminated. I found the first two rounds of the tournament on Thursday a bit challenging to follow. The arena floor had eight mats laid end to end. 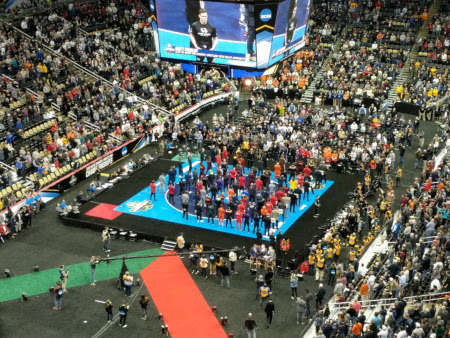 While the NCAA used the arena ribbons to highlight the wrestlers on each mat, it was still difficult to follow. They would rotate matches that were heating up on the big screen in the middle of the arena. Still, it was hard to catch all the action over those eight mats. Our seats were up high, in the center of the arena, which was beneficial to being able to see all the action. Those sitting down low certainly would be getting a better view of some of the mats, but certainly not all of them. 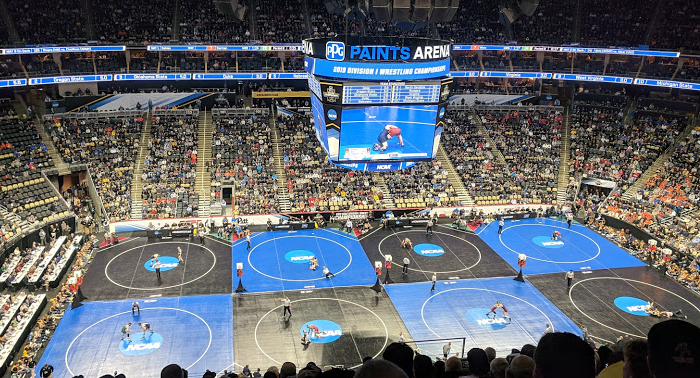 On Friday and Saturday, the continuing championship rounds were held in the center mats and the consolation matches to the outside which made for much easier watching. I had bracket sheets to keep track of the action which in my mind is essential to watching the tournament. There was an app developed by the NCAA, but it was a bit buggy to be honest. I found the old paper method far more reliable. By far, the best sessions were the semi-finals and the “blood” round. If you win in the “blood” round you are guaranteed at least 8th place and will be an All-American. Anyone who has made it that far is clearly a great wrestler. Those matches are extremely intense and very exciting. The Saturday sessions are probably better in the morning than at night. If you have been to even jr high wrestling tournaments, you would probably recognize that. Often times the wrestling in the finals is a bit anti-climatic. Wrestlers either become conservative, trying not to lose or they are just happy be in the finals. The late morning medal rounds easily matched the medal round for excitement. The finals, of course, were a big production number. Certainly there were some exciting matches. Rutgers had their first ever two champions with Nick Suriano at 133 and Anthony Ashnault at 149. 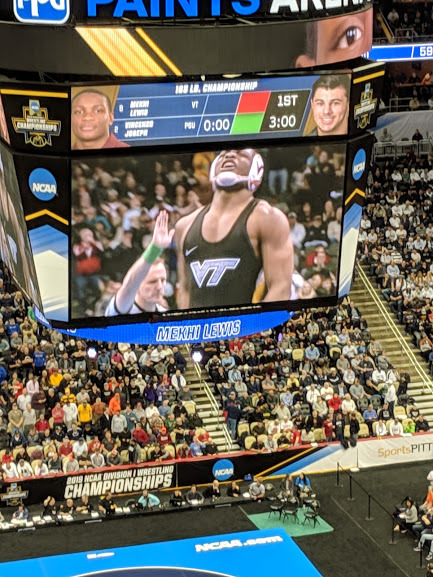 Virginia Tech’s Mehki Lewis at 165 pounds, was an eight seed who managed to get the Hokies their first championship as well. 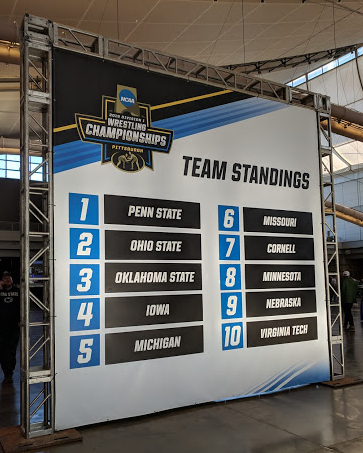 Penn State dominated the overall team battle, winning their eighth title in the last nine years with three individual champions, Jason Nolf (157), Bo Nickal (197) and Anthony Cassar (285). Without a doubt, the Nittany Lions wrestling program is the biggest dynasty in sports today. It should be no surprise as their head coach, Cael Sanderson, relishes being in Pennsylvania and its fertile recruiting grounds. Along with strong representation from other universities such as Lehigh, Lock Haven, and Pitt, PA kids were further represented across the other teams. It was noted that Pennsylvania had, by a large, the most wrestlers in the tournament. PPG Paint Arena is your standard pro style arena. It did have a nice mix of local vending at the stadium between the food and the Iron City beer. The site was an easy walk from the center of the city and most fans walked back and forth from the stadium to hotels downtown. The arena is home to the Penguins so the the black and gold was fairly dominant. 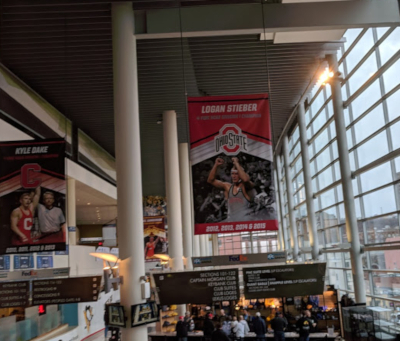 However, the NCAA travels well and there was quite a bunch of NCAA banners and other promotional propaganda. It made the site fairly neutral. The actual stands in the arena had their own scholastic flavor. Sections of the arena are sold to individual schools, most of whom coordinate their attire each day. It gave a very collegiate feel to the pro stadium. 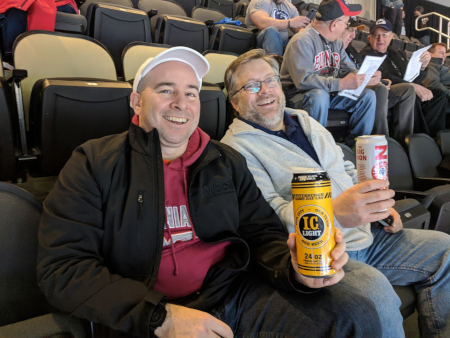 If not for the five Stanley Cup banners hanging from the rafters, you would almost forget you were in the Penguins’ arena. Pittsburgh is not the easiest city to get to as it is no longer a major airline hub. However, the charms of the city are obvious, once one clears one of the myriad of tunnels into the city. It opens up to a confluence of three rivers upon which the downtown sits. Getting into the city through one of the bridges is easy, but moving from neighborhood to neighborhood can be daunting to the uninitiated. Being able to walk to the arena from local hotels was certainly a positive. The city was clean and we felt safe at all hours of the night. The food and beverages were very affordable. Pittsburgh is primarily a sports town, but is also smart town with strong academic institutions such as Carnegie Mellon. Normally hotels are reasonable. However, with the strong demand, the rates for the weekend were high. We ended up paying about $200 a night and we got that rate through an inside connection. Wrestling is a physically demanding sport. As I have mentioned in the past, I did play four years of Division III college football. There were a few ex-wrestlers on the team and we all agreed to a man, that the hardest football practice was a cake walk compared to wrestling practice. Accordingly, the bonds and mutual respect of wrestling teammates tend to run deep. 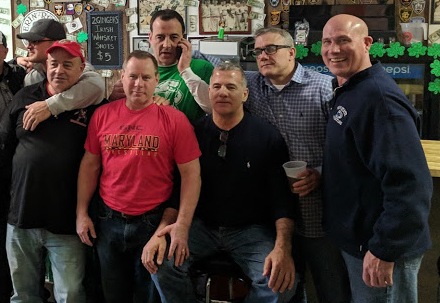 It was clearly in sight as we saw the Maryland wrestlers hang out together. The camaraderie was clear, so much that these guys didn’t mind cramming four middle aged men into one hotel room. I am tight with my high school buddies, but the days of me sharing a bed with another hard snoring, smelly guy have long passed. 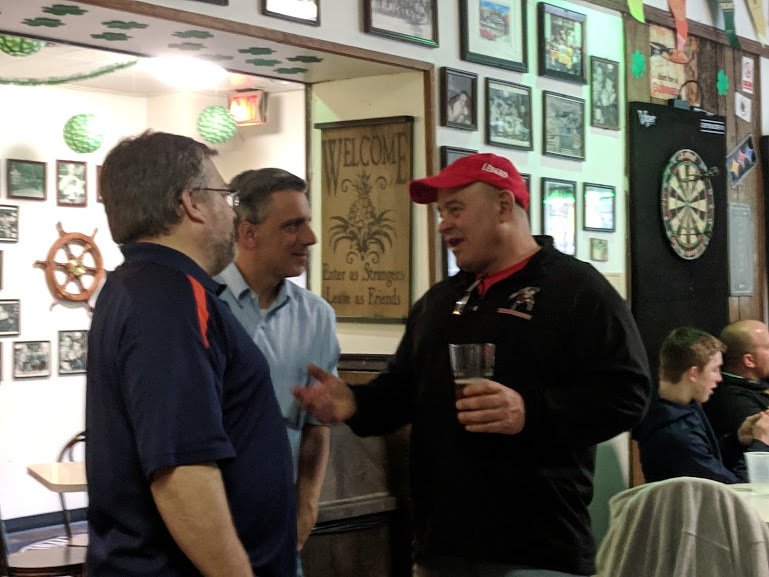 I enjoyed the company of the Terp wrestlers, even the one that would give Archie Bunker a run for for his archaic politics. The guys were quick to buy you a beer and there was none of macho posturing you might see from MMA guys. In fact, the absence of MMA bros was as shocking as the bumper crop of cauliflower ears present throughout the weekend. My older brother also wrestled and he has an awful looking cauliflower ear. That crinkled mess of hardened cartilage was all the incentive I ever needed to religiously wear my headgear. At times, the Maryland guys were a little more interested in reminiscing and drinking than watching the wrestling. My buddy Dave, a very successful New England high school wrestling coach, is a wrestling junkie so we didn’t miss a round. In fact, he was so anxious, we went to the “blood” round an hour earlier than the start by accident. He was like a kid who didn’t want to miss a second of the action. He was constantly bumping into people he knew. I, too, would occasionally come across old acquaintances. What you didn’t come across during the weekend was a lot of women. And as one guy pointed out, the ones you did see didn’t look much better than the men. There was more sausage at this event than at an Italian butcher shop. If you do go, tell the wife not to worry, this truly is a guys’ weekend. 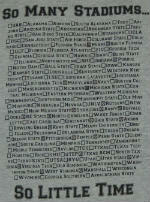 This entry was posted in Uncategorized by somanystadiums. Bookmark the permalink.